This was the highest charting hit and greatest claim to fame for the now all-but-forgotten early rock group The Playmates. Despite this, they had four other Top-40 hits in the Billboard Hot 100 in the late '50s / early '60s. The Playmates were Chic Hetti (piano), Donny Conn (drums), and backing vocals (and presumably auto hornist) Morey Carr. The Playmates all hailed from Waterbury, Connecticut, and met at the University of Connecticut, where they originally started touring Canada as a comedy group called "The Nitwits." They gradually transformed into The Playmates as they took up singing, though they always kept a comedy routine in-between songs in their stage act. Now for the car lore: This song (from 1958 - before most of you were born) is also known as "Little Nash Rambler" or simply "Nash Rambler" and is sometimes mislabeled or even requested by that name on the Dr. Demento show. 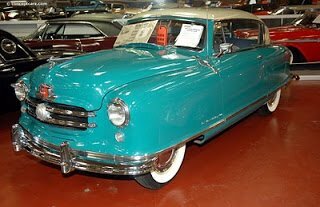 A Nash Rambler was a kind of car produced by Nash Motors in 1950, and it was a bubble-shaped little bug that was to become the first compact car manufactured and sold in America. As you can imagine, the car met with some scorn from the majority of the American driving public, who were used to driving big Caddy land yachts and looked down their noses at compacts, when they noticed them at all. It was World War 2 that introduced Americans to compact cars, when servicemen stationed in Europe got to like them over there. The humor of this song revolves around the ironic race between a Cadillac and a Rambler, with a stunner punchline. Ha ha MOF that song brings back memories and I saw 2 or 3 of those fun little cars over here in the UK. Must admit though, I'm looking at that piccy and for the life of me I can't work out how you'd turn the front wheels? You had to put your feet on the ground through the holes in the floor an physically lift the car, then place it in it's new direction. This was very cumbersome of course but they made them 50% cheaper because of the design fault. Only strong people managed to drive them but the real up side was there was very little tread wear.